Birds sing a love song. Tickle, giggle, and play along with this sweet rhyming board book with plush finger puppet, which delivers heartfelt sentiments of love to baby. The colorful butterfly finger puppet is sure to provide hours of giggly fun and is perfect for cozy laptime reading. 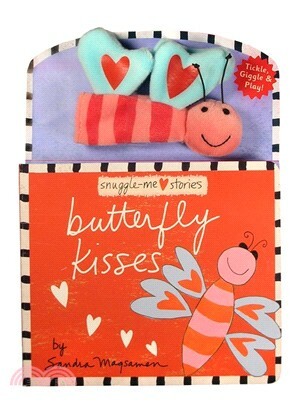 Butterfly Kisses will inspire parents and caretakers to cuddle up and read together with their little ones and shower them with butterfly kisses! Sandra Magsamen has touched millions with her inspirational words of love and caring. Now these heartfelt sentiments will reach the youngest and cutest of all audiences - babies! Inspired by the rich diversity of ways in which people share their feelings, internationally acclaimed artist and author Sandra Magsamen has enchanted people with her signature style of complementing life-affirming phrases with her vibrant designs. Her collection includes everything from books and coffee mugs to ceramic birdhouses, teakettles, and scrapbook materials. Sandra Magsamen lives artfully with her family in the Maryland town in which she grew up.